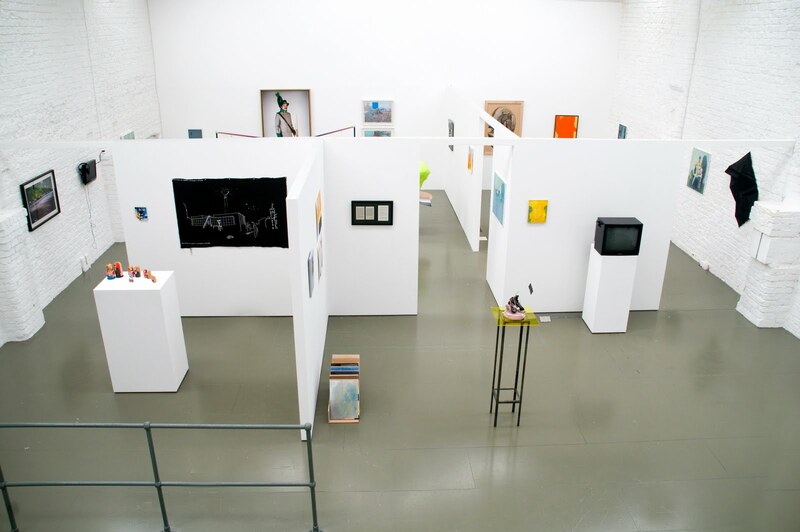 The Ceri Hand Gallery has blazed a trail as a high-quality commercial gallery in Liverpool, its exhibitions often out-classing that in some of the city’s public venues, this despite its location on the fringes of the still un-redeveloped northern docklands. This exhibition, one of the largest to have been staged in the former warehouse which has been nicely converted into a white-cube type space, features over 100 works and has been curated by the gallery’s artists themselves. Based on the philosopher Henri Lefebvre’s concept of a ‘memory of a hope’, the theme was chosen by sculptor Matthew Houlding, drawing apparently on ‘reflecting spaces caught between construction, destruction and nostalgia’. Each artist involved picked two other artists whose work they would like to see in the exhibition alongside their own, with the show put together from the pieces subsequently submitted. As with any group show, especially one as crammed as this, the works on display are hit and miss and dialogue between pieces often limited. Works of note include Geraint Evans’s ‘Homebase’ (2011), an oil painting of a log cabin display in the corner of a DIY store. It captures in vividly the attempt at an idealised, ‘take-home’ aesthetic, marred by a collapsed corner of the cabin’s flimsy picket fence and the shop’s grim utility. Curious in its technique and vision is Kim Rugg’s ‘This is War Kid’ (2008) a comic book carefully cut up and re-assembled fractured, creating a multi-textured work that is almost sculpture. Also of note is Mary Griffith’s ‘Where Few Dwelled’ (2010/2011) series, a collection of detailed graphite on paper works, formed from interlinked patterns and shapes, which moodily recall the infinite world of space and physics. A highlight is Riccardo Baruzzi’s ‘B_2134567’ (2011). Apparently a screen grab from the Head-up display of a military aircraft after its weapons have hit their target, the materials are shaped into a stark 3D topography that could be a representation of the landscape that is being devastated. Its content, form and colour are all riveting. Oddly compelling is Tessa Power’s ‘A Happy Death’ (2011) a film work across three separate CRT monitors of a horse, on each monitor red, blue and green respectively, collapsing, dying and then getting back up. Another couple of works fascinating in detail and technique are Elizabeth Rowe’s ‘Rock Walks’ and ‘Nail House’ (both 2011) made from newspaper sheets obliterated and enhanced by colour and patternation – a complex and intense re-appropriation of a mass media product. This review appeared in Aesthetica magazine August 2011.